Greetings from sylhetstore.com. You are now reading a blog post about how to customize a website created on wordpress. 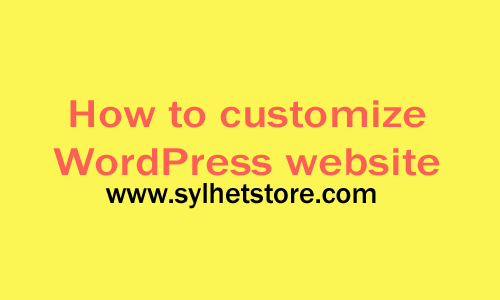 In this section of sylhetstore.com , you are able to know every single step and process how can a user customize his/her website without any coding language. You do not need to know any coding language because wordpress is a CMS -Customize management System. So, let’s start our journey towards wordpress customization. At the beginning I am going to tell you that you can practice website customization on wordpress without paying any single penny. WordPress allows its users to create blog and customization as well as to write numerous blog posts without any charge, free at all. If you create a blog on the wordpress.com you have already known about logging and creating blog. Let’s going to the admin panel where you will see every necessary option and which allow you to modify your blog. Start our customization lesson with creating a page on the wordpress. If you look in your window left side, you will see there is a command line called page. Click that line which will bring you to the page window. At the top you will see there is a line called create new page, click that. A new page will open and ask you some more information i.e. giving page name. Name it as home and click the publish button. A page will be created for your blog. Done! Now let’s go to create menu for your blog. From the left as you did before will see Appearance. When will you hover your mouse pointer over it a sub menu will appear and from that click at the menu. Menu window will open. There you will see several command lines. Click create new menu and name it as menu and click create. A menu will be created. Now add page to this menu. Form this window you will see a sub window in the middle and there you will see add to menu option. Click that and mark which page you would like to add to the menu. After mark, click add, eventually all marked pages will added to the menu. Done! Now follow the same direction described before on the Appearance and click customization. Now a fresh window will open and you will see all necessary and relevant option on that window. Let’s add a logo for your blog. Click from the left where there you will see logo option. Before adding a logo you need a jpg file image and hope you save it on your desktop. Click add to add a logo and it directed you to add your image which you already saved on your desktop. Click add button to add it and it will save on your blog. Some theme will auto crop your logo and some will ask you to crop. Do it as instructed. You can change theme color. Add about yourself and after completing everything you need just click publish. Your blog just has ready to publish. You can modify when you need and which you need to change coming back to this window. ← সফল হওয়ার আগের কথা ! হয়ে উঠুন গ্রাফিক্স ডিজাইনার.